Does Your Child Have Poor Gross Motor Skills? Having poor gross motor skills can affect so many areas of a child's learning and life, as I have explained elsewhere on my site. Taking part in games and sports days, being able to sit still in the classroom, having the endurance to go for a family hike... these areas and so many more are affected by poor gross motor skills, and it is hard for a parent to watch a child struggle. On this page you will find some issues and questions that parents have raised, and hopefully you will find some of the answers and comments to be helpful. If your child has poor gross motor skills and you are looking for activities, then pop over and view a wide range of easy, practical, photographed gross motor activities that I feature on my site. You can also check out gross motor activities you can do in the classroom, or during homework time. 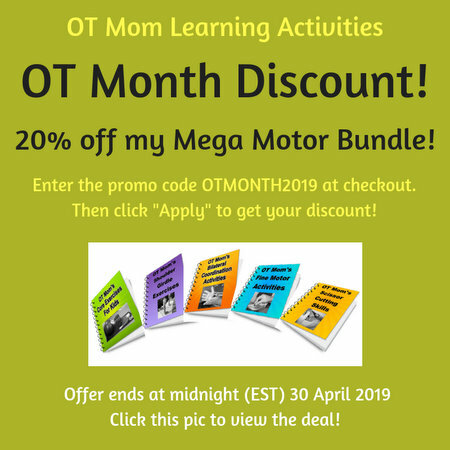 Or try my OT Mom Gross Motor e-books to get all my gross motor activities in an accessible, downloadable format.